Perley Rideau is committed to becoming a Centre of Excellence in Frailty-Informed Care. Many programs and resources are already in place to support this important phase of the strategic plan. Applied Research to Advance the care of the Frail Elderly. As leaders in caring for frail elderly and an expanding continuum of innovative programs and services, Perley Rideau is continuing to develop and strengthen partnerships with academic institutions, government agencies and industry in order to drive excellence in frailty-informed care. Perley Rideau plans to remain true to its longstanding commitment to research and learning, and will deliver even greater value to the healthcare system through the development of a Centre of Excellence (CoE) in Frailty-Informed Care as part of the current strategic plan. By expanding programs and services along the continuum of care, facilitating strong collaborations with researchers, academic institutions, community agencies and industry, Perley Rideau will seize opportunities to lead and participate in innovative initiatives that will advance care, research and knowledge translation in frailty in long-term care. 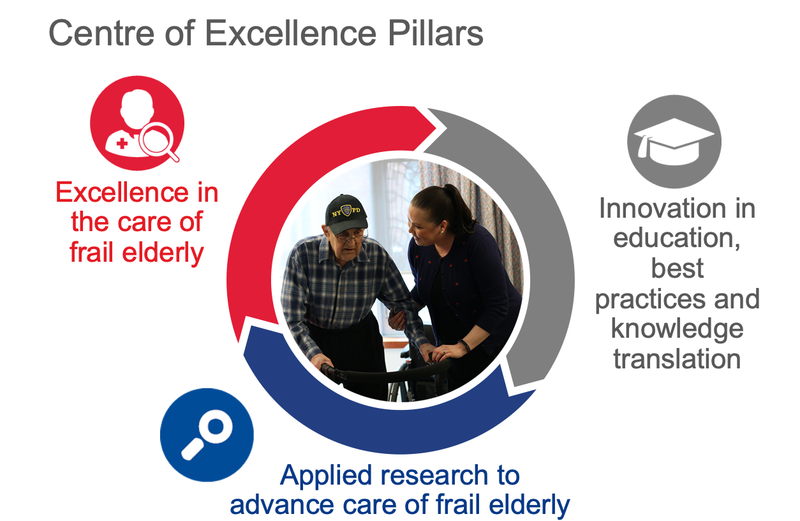 The Centre of Excellence will optimize the quality of life of frail elderly through three areas of focus which form the pillars of the Centre of Excellence. Each pillar includes key initiatives and goals that will grow and expand with the evolution of the Centre of Excellence. Although conceptually distinct, when applied, the CoE pillars are highly interconnected. For example, research priorities will be determined based organizational strengths, expertise and ability to make a meaningful contribution to the Perley Rideau community and beyond. This will create opportunities for knowledge translation where findings can be shared and applied to help further develop and enhance clinical care. This symbiotic relationship between the pillars will promote a culture of continual learning and research that will promote excellence in frailty-informed care. Excellence in care of the frail elderly will be achieved through a frailty-informed approach to care which involves a comprehensive assessment and discussion with the person and their family to determine what matters most to them. This holistic view connects individual needs, goals, strengths, values and preferences to develop a plan of care the focuses on optimizing the quality of life of the resident/patient/client, in close partnership with families. Developed at Perley Rideau, this model will include assessment, management and communication tools that are tailored to a long-term care setting, yet adaptable to other care settings for frail elderly as needed. Staff will be trained and will have the necessary clinical and interpersonal competencies that are essential to a frailty-informed approach to care. The development of specialized clinical programs that are tailored to the needs of frail elderly will be included in the work’s focus. This pillar will support and enhance innovative education and teaching activities that will be designed to be shared across sectors. Perley Rideau will set the standards of practice for frailty-informed care in long-term care and spread this knowledge to other homes and care settings. It will continue to attract students by its approach to learning where knowledge can be applied at the point of care using innovative methods to enhance practical skills. Perley Rideau is in the process of developing a robust research program with a focus on frailty. As the organization continues to excel in its capacity and expertise to care for frail elderly, we welcome opportunities for linkages with industry and academic institutions and other organizations with an interest in innovation for frail elderly. The activities within this pillar will advance relevant research that aligns with our expertise and addresses the specific needs of our population. Using a problem-based approach we will co-create and test innovative technology that will provide solutions to improve the quality of life of the frail elderly within our community and beyond.